It’s an unlikely partnership, since scientists and commercial fishermen haven’t traditionally had the best relationship. Against big odds, these two have worked together for the past six years to figure out the best way to increase oyster populations in the estuarine of North Carolina’s coast. Waters were once abundant with oysters, but now their populations have been decimated because of overharvesting and habitat destruction. Dr. Neils Lindquist is a researcher at the University of North Carolina’s Institute of Marine Sciences in Morehead City. Oysters are important, economically in North Carolina. According to Dr. Lindquist, the oyster harvest over the past few years has been steady at $250 million dollars. The industry provides local jobs and the product will be sent to seafood markets and restaurants here locally and internationally. Oysters are also highly valued because of they clean the water. Mollusks have the ability to filter up to 50 gallons of water each day. 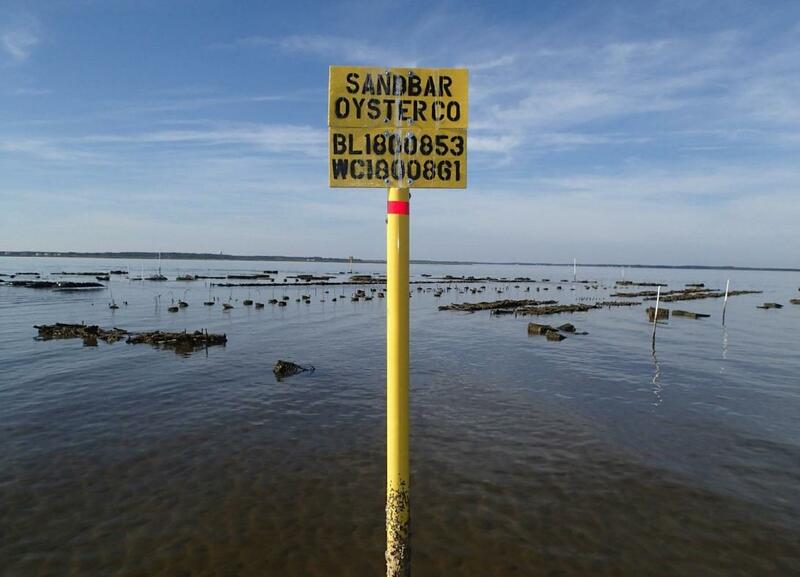 Over the past few decades, local scientists and conservationist have developed methods to restore oyster populations. One of the more successful efforts is the creation of manmade oyster shell sills. A pile of loose oyster shells or marl is placed in shallow water, creating a barrier that runs parallel to shore. The rock or shell material can also be placed inside mesh bags. Plants can be added around the sill to create a living shoreline. The idea is that oyster larvae will attach to the substrate and you have an oyster reef. 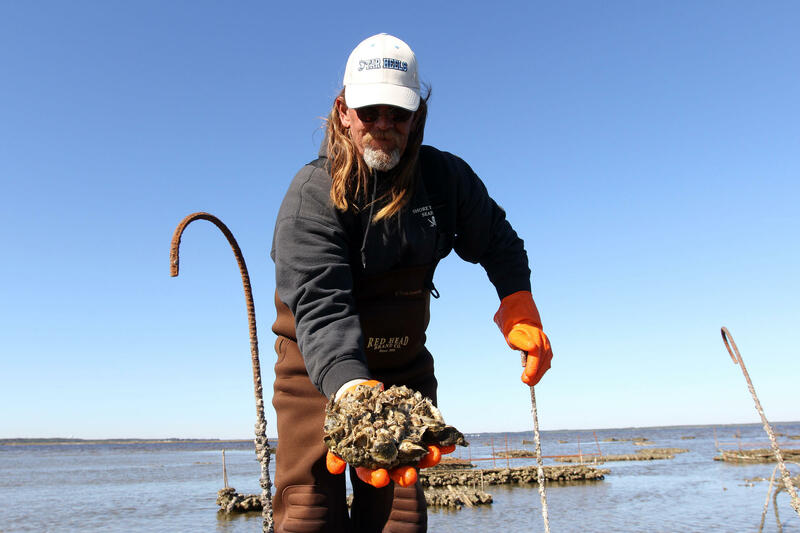 While this is still an effective practice for oyster restoration, Dr. Lindquist called upon the local knowledge of David “Clammerhead” Cessna, a seventh generation fishermen in Down East Carteret County to improve upon traditional methods. Together, they’ve experimented with different types of materials to get to the most effective way to restore oyster populations. 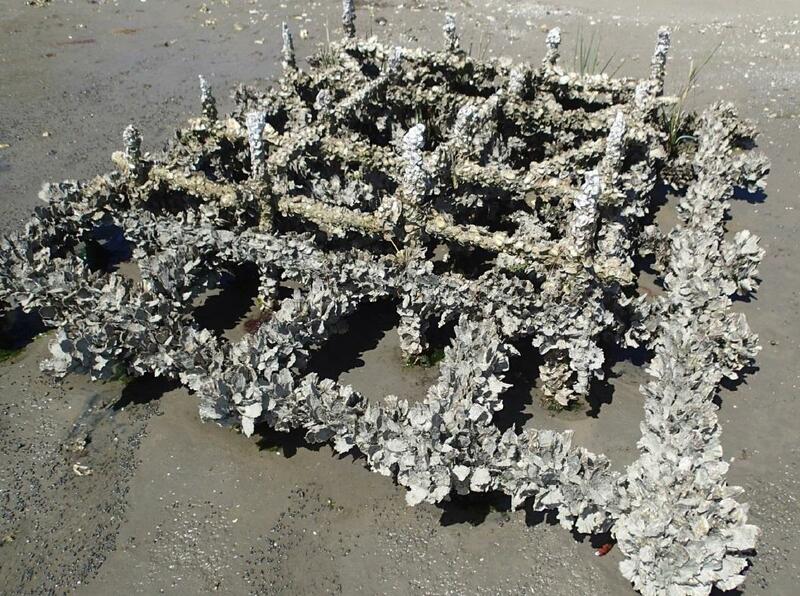 Their improve method for restoration bypasses marl and oyster shells and instead uses an ephemeral, plant based material to create structures for oyster larvae to attach to. Clammerhead, who left his job in construction to return to his love of fishing, is using his building skills to create reefs. The plant based reef material can be molded into different shapes and sizes, from flat square mats to long, rod shapes, pyramids, and something that he refers to as a cow patty. This dynamic duo has tested new material and a variety of reef shapes behind the Institute of Marine Sciences in Morehead City. The site is located on the busy Bogue Sound waterway which is exposed to strong southwest winds and frequent yacht wakes three to four feet high. Dr. Lindquist says their method is showing marked improvements over traditional oyster sills. There are several advantages to using this new material to build reefs over traditional methods. If oysters fail to grow and cover the mesh bags, they eventually tear open, the shells scatter and the plastic ends up in the environment. However, the new biodegradable substrate material eventually disintegrates in the water and the concrete crumbles into small pieces and becomes part of the sediment bed. Another benefit has to do with the way the reefs are designed. Each three dimensional structure is elevated above the bottom. Since it isn’t submerged in sand, Clammerhead says oyster larvae can settle on all sides of the substrate. This results in more oysters which means more filtration which leads to healthier waterways and a more prosperous fishing industry. In addition to creating micro-habitats, another advantage to these rigid structures is that they can be anchored in place in intertidal areas with strong waves and currents. Dr. Lindquist says more water movement carries more food to the reef, resulting in faster growing oysters. Dr. Lindquist says they have been able to cut that time by almost half, growing market-sized, high quality oysters in only 12 to 15 months. The scientist and the fishermen leased another testing site in the Newport River- an intertidal area- where a small portion of the 1.3 acres was covered with the substrate. Their conservative estimate is that 3.6 million oysters have grown at the site, though it’s probably more like five to six million. That brings up another interesting point with this new method. 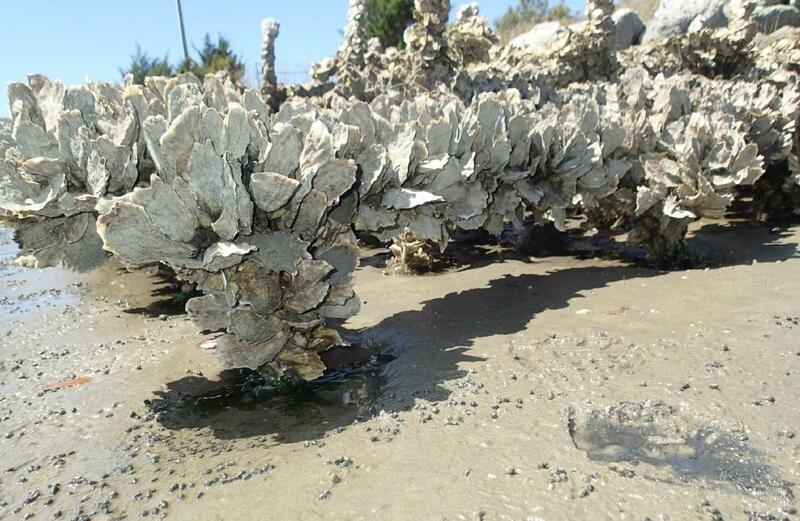 Before the reefs were placed in that leased area, oysters didn’t exist there. It was just sand. These reefs can be used to create thriving oyster habitats in places where they didn’t previously exist. 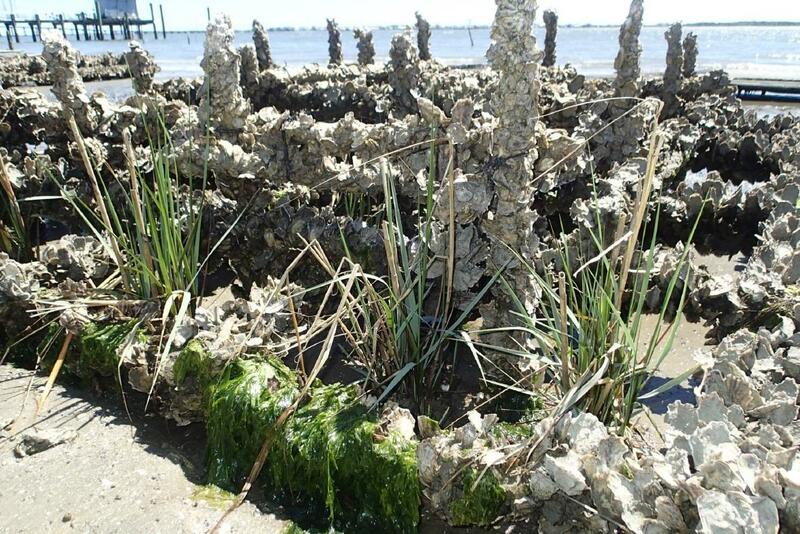 Dr. Lindquist hopes the new material and the methods they’ve found for growing oysters will create opportunity for conservationists and even waterfront homeowners who want to create a living shoreline in their own backyard. 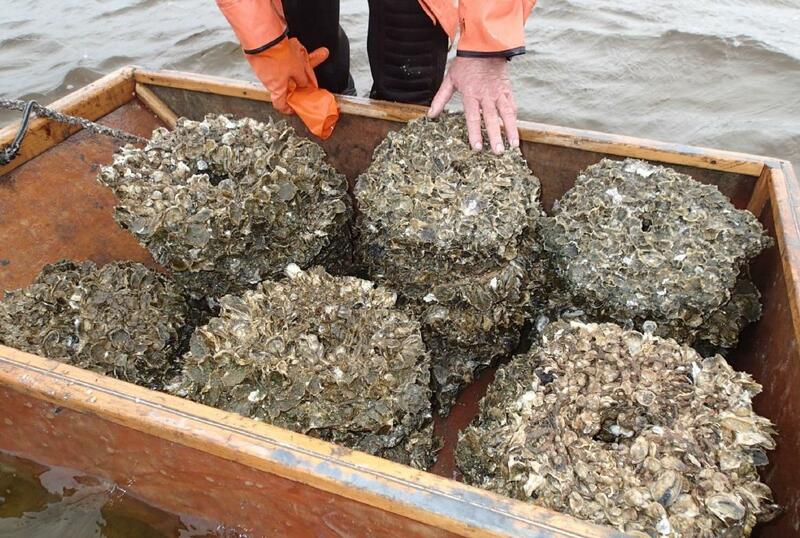 Word about the new oyster reefs has circulated around the fishing community Down East. Clammerhead says some his friends are interested in being a part of it. In the past, the relationship between scientists and commercial fishermen has been strained. But Clammerhead says this project has proven that scientists and fishermen can work together, and when they do, the results benefit everyone.